The late Reverend George E. Weaver’s tenure as senior pastor was marked by tremendous growth and expansion of the church before the late Dr. Mack King Carter assumed his role as senior pastor after co-pastoring with Rev. Weaver for 16 months. 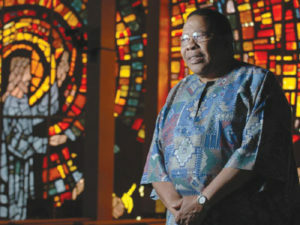 This ushered in a new era in which the church reflected his brand of “liberation theology” in which he sought an even greater role by the church aimed at taking the word of God from “the pulpit to the pavement.” Dr. Carter felt the need to transition the church to meet both the spiritual as well as socio-economic needs of the community. Beginning in 1982 under Dr. Carter, the New Mt. Olive Baptist Church expanded its influence locally, nationally, and internationally culminating in a full-time missionary project in Kenya, East Africa. During his tenure, the mortgage on the current facility was burned in 1989. 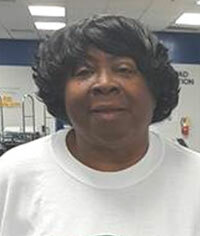 As the saying goes “behind every great man is a great woman,” Patricia Carter, the widow of Dr. Carter more than fulfilled her role as First Lady of the New Mount Olive Baptist Church, every step of the way. Mrs. Carter joined the church under Rev. Weaver at the old sanctuary after moving to Ocala, Florida and marrying Dr. Carter. ‘My husband definitely believed in the gospel of salvation but also in a gospel that extended beyond just the church building and beyond. People had to see the church having an impact,” added Mrs. Carter. “I think for any institution or organization to last for a century is just phenomenal and I feel really blessed to be a part of the celebration. Reverend Wayne Lomax joined the ministerial staff in 1985 and served 12 years under the leadership of Dr. Mack King Carter. “Every great preacher in America visited Mount Olive under Dr. Carter’s tenure including the late Gardner C. Taylor, Dr. William Augustus Jones, Dr. Leon Sullivan, Dr. Joseph Jackson, Dr. Fred Shuttlesworth, Dr. Martin Luther King, Sr.,” said Reverend Lo-max. “Now begins the second century! I am confident that you will soar higher, dig deeper, stretch wider, and stand fast on the Firm Foundation,” added Reverend Wayne Lomax. Although Dr. Carter’s span of influence extended far and wide reaching and impacting thousands of lives, he had a unique impact on Dr. Rosalind Osgood, an associate minister at the New Mt. Olive Baptist Church and church member since the age of seven under Rev. Weaver. Dr. Osgood also serves as President/CEO of the Mount Olive Development Corporation founded by Dr. Carter. After an extensive nation-wide search, the church began the arduous task of trying to fill the shoes of Dr. Mack King Carter. In 2009 a 34-year-old preacher’s son from Tuscumbia, Alabama by the name of Marcus D. Davidson assumed the mantle of leadership as senior pastor of New Mt. Olive Baptist Church. Reverend Dr. Marcus Demond Davidson is a native of Tuscumbia, Alabama. He is the son of Rev. Dr. Green Davidson, III and Mrs. Barbara Bostick-Davidson. He has four siblings: Vanessa Batten, Latresha Davidson-Woods, Rev. Green Davidson, IV, and LaBradford Davidson. He is married to Mrs. Yvokia Jones-Davidson; they have one child, Layla Alexandria. He is the Senior Pastor of New Mount Olive Baptist Church in Fort Lauderdale, Florida and President and CEO of PMD Ministries, Inc., offering seminars, lectures, workshops, and curricula focusing on leadership. Since 1983 Deacon James Elliott has witnessed first- hand the in print that Rev. Weaver, Dr. Carter, and now Rev. Davidson have had at New Mt. Olive.